The Union Tavern has recently had a refurb. And most things are better. The green (original) tiling outside is much better than that dreadful grey paint. London Pride is the house ale; there are three or four guests, mostly from other London breweries. A wide selection of craft beer is available also, again mostly London brews. Live blues once a month with house band and guests, rare soul night bi-monthly, meet the brewer events once a month... Monday is £3 a pint for ale and Wednesday is quiz night. I've been using this pub since 1987 when in the area and a regular since 1995 when I moved here and continue to do so. Concur with blue scrumpy here. An excellent range of beers (5 real) from micro breweries as well as one from Fullers that you don't normally see. Friendly landlord, homely pub. And that's in the middle of winter; must be gorgeous in the summer by the canal By the way the name is Union Tavern. 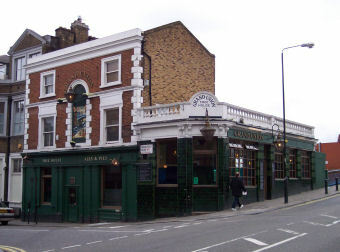 This is a canalside Fullers pub a short stroll from Westbourne Park tube. But it's unlike any Fullers pub I've been to previously with a good range of cask ales and also a large craft beer selection. Ales on handpull were Redemption Pale Ale & Rock The Kazbek, Mondo James Brown Ale, Fullers London Pride & Five Points Pale. The keg selection is served from taps at the back of the bar and included a couple of Fullers beers, plus others from Meantime, Camden, Trumans, Kernel, Uprising & Weird Beard. The interior is split over a couple of levels and is fairly modern. The clientele seem to be a fairly trendy bunch. One to recommend. Had a fine pint of Redemption Trinity here the other day (�3.50). Also on handpump: Pride, Wild River and some other guests including Hopspur. Can also vouch for the fish and chips with mushy peas (�10). Since the refub the pub is more disabled friendly: main bar on one, rather than two, levels; spiral staircase replaced by one that is probably easier to negotiate. Look forward to the open mic nights. I had my wedding party for 85 people at the Grand Union last weekend and hired the whole pub, and I honestly could not recommend it highly enough. It was a fantastic day - the layout of the pub is perfect - the guests arrived by boat to the outdoor terrace, where we had meze style food, pates, empanadas and sangria. It was drizzling at this point, but with the huge heated umbrellas that can be set up to cover the whole terrace area, it didn't matter at all. The large top room was set out with big tables and had the perfect relaxed atmosphere, and the snug downstairs is ideal for dancing - I don't like a huge dance floor where you feel exposed, but this was just right. We left pub games on the tables outside after dinner, where people could chat, play cards or checkers etc and have a whiskey. The food was amazing, the pub designed a menu with us and we choose to have food brought to each table for people to share - someone had to don an apron to carve the meat, which was fun and a real hit with the guests. I'm vegetarian but my husband is a great meat eater, and everyone ate really well and praised the food. The staff were courteous, attentive but also fun - they made up the chalkboards in the pub for us, and designed a soft play area for the kids with sofas and a floor mat. The pub is also beautifully decorated inside with atmospheric lighting, which really set off the flowers and table decorations. It was a great day and that was all about the location - we're already planning a Christmas party!